I heard Peter Murphy's excellent version of 'Final solution' from his first solo album Should The World Fail To Fall Apart in 1986, and had to backtrack to get to Pere Ubu's original from some ten years earlier. Murphy is faithful to the spirit of the song, but his arrangement, and his vocal in particular, take it much closer to mainstream alternative rock. No matter; it's a great cover. But Pere Ubu really threw down the gauntlet with 'Final solution', their second single, in 1976, most easily available on their compilation Terminal Tower. 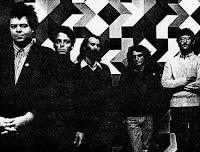 In Cleveland Ohio, with kindred spirits Devo down in Akron, Pere Ubu crystalized an avant music scene where no one might have bothered to look otherwise. They persist to this day, though with only vocalist David Thomas present in all incarnations. In his brilliant book Rip It Up And Start Again - a must-own for anyone with an interest in post-punk - Simon Reynolds gives a great overview of Pere Ubu on pages 70-76. He discusses their industrial wealth-meets-bohemian indulgence roots, and their extreme desire to avoid the prevalent influences of both "black music" (presumably blues, R&B, reggae, dub) and on the opposite extreme, British punk's nihilistic stance against music history. Pere Ubu are intellectuals, which clearly shows in their name, performance strategies, songs, and career choices. To my surprise, Reynolds doesn't mention 'Final solution' in his six pages on Pere Ubu, focusing instead on their first single, '30 seconds over Tokyo', which, though stylistically quite similar to 'Final Solution', is a much less traditionally structured pop song. 'Final solution' is one of Pere Ubu's most cogent songs, channeling their expressionist and absurdist inclinations into a more accessible track than much of their other early work. 'Final solution' is essentially a very straightforward garage band arrangement made distinct by a sound collage from Allen Ravenstine's synthesizer, ranging from futuristic chirps to abrasive industrial scrapings. It is rendered unique by David Thomas's bleating vocals, which sound untrained and masterful at the same time. The lyrics include some of the smartest one-liners post-punk ever saw. We meet an apparently teenage narrator who is alienated by his body ('Girls won't touch me 'cause I got a misdirection'), his family ('Mom threw me out 'til I get some pants that fit') and his society ('A little bit of fun's never been an insurrection') in only the most typical adolescent ways. He segues into escapist choruses: 'Don't need a cure/Need a final solution' that are ominous (though the Nazi reference was unintended) yet, despite their seeming threat of suicide, not real enough to be seriously concerning. The falsetto 'oohs' at the end mark a visceral release that is blissful and creepy at the same time, the perfect note to strike by then. Pere Ubu must be satisfied to know that their gauntlet has never really been picked up since. Then again, this song might not count among their most satisfying early moments; when Nazi imagery found favor as a shock tactic among later punk rock acts, Pere Ubu dropped 'Final solution' from their performance repertoire, to avoid any comparisons. Regardless, Pere Ubu were the best example in their time of how rock could be intellectual without being prog or highbrow performance art. This was a new music that satisfied the post-punk criteria and maintained its strange bourgeois distance at the same time.